U.S. deploying troops to Cameroon as part of new regional approach to fighting Boko Haram. Why Is the U.S. Sending Troops to Cameroon? 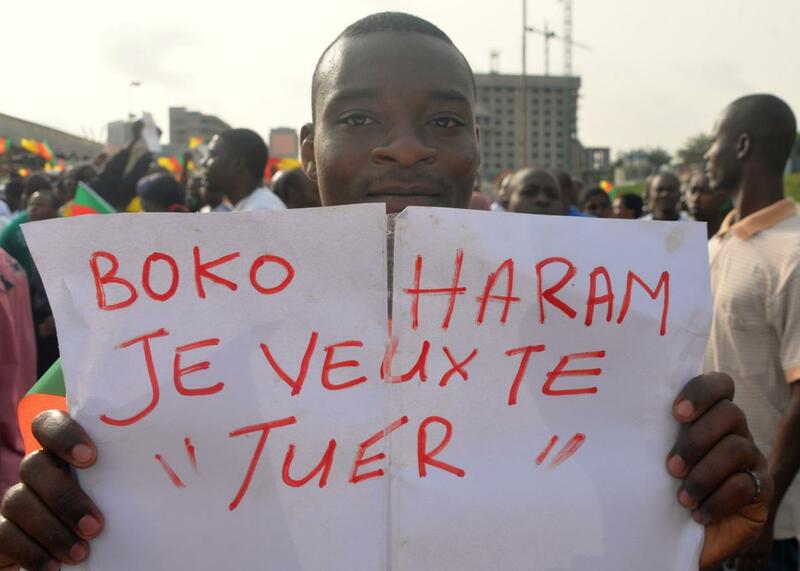 A man holds a placard that reads “Boko Haram, I want to kill you” during a demonstration on Feb. 28, 2015, in downtown Yaounde, Cameroon. At the same time President Obama is announcing that U.S. troops will remain in Afghanistan for far longer than anticipated, he has also announced a new deployment of U.S. armed forces—in Cameroon. The 300-troop force will conduct airborne intelligence and reconnaissance operations to help the fight against the insurgent group Boko Haram. The U.S. deployed 80 troops to Chad to combat Boko Haram last year amid the international outrage over the abduction of 200 girls from a school in Chibok, Nigeria. That mission, which involved conducting surveillance flights in cooperation with the Nigerian military, wrapped up late last year. Boko Haram, which affiliated itself with ISIS in March, has spread its area of operations from its original stronghold in Northern Nigeria into neighboring countries. At least 36 people were killed in a suicide bombing by the group targeting Nigerian refugees in Chad earlier this week. It has attacked civilian and military targets in Cameroon as well. The new mission may have been influenced by a report commissioned by the Pentagon in March that recommended partnering more with other regional governments to fight Boko Haram, rather than relying so heavily on cooperation with Nigeria alone. Nigeria’s military has itself been accused of widespread atrocities in the fight against Boko Haram, and the government lacks credibility in the country’s less economically developed, predominantly Muslim north. It was hoped that the election in April of Muhammadu Buhari—a former military leader who is himself a Muslim from the North—would help the government’s cause. But despite Buhari’s promise to wipe out the group within the next few months, Boko Haram has continued to launch attacks. The new U.S. mission may have better luck than its predecessor, but the past months have not been encouraging. A year and a half since they were taken, the girls of Chibok are still missing.